A few years ago I was sent a Handwoven browband to review for Haynet. However, this was published on Haynet and since their website face lift, it has come offline. I really liked this browband and still have a copy of the review. So I thought I would share this with you. I was extremely lucky to be chosen to review one of Handwoven’s made to order browbands. At the time, I wasn’t sure exactly what I wanted, so I left it up to them, just giving them my preferences of brown leather with blue and green colours which wouldn’t clash with a ginger. So it was a lovely surprise when this turned up! The design is double stitched cobra with diamante studs and royal blue and I think bottle green (but could be olive) stitching. It just looks amazing. 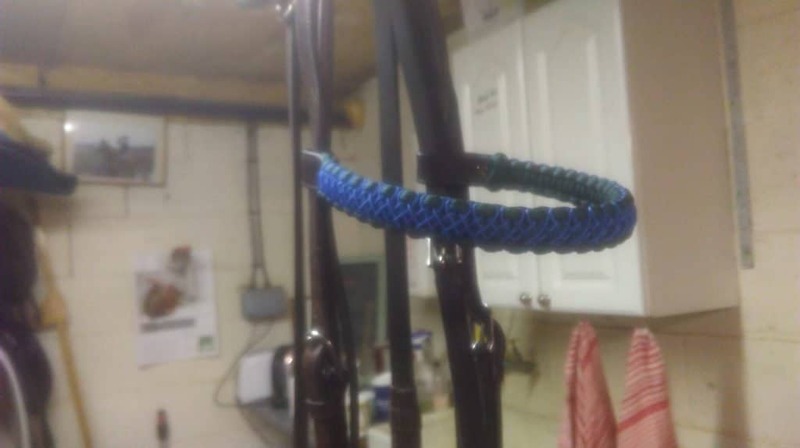 I couldn’t wait to get down the yard the next day to attach it to my bridle and try it on. Browband. The loops are big enough that they are easy to put on and adjust, but don’t slip around on Scottie’s head. You can also measure your bridle when placing your order and they can change the loop size to make sure it fits. The browband itself also fits Scottie perfectly. 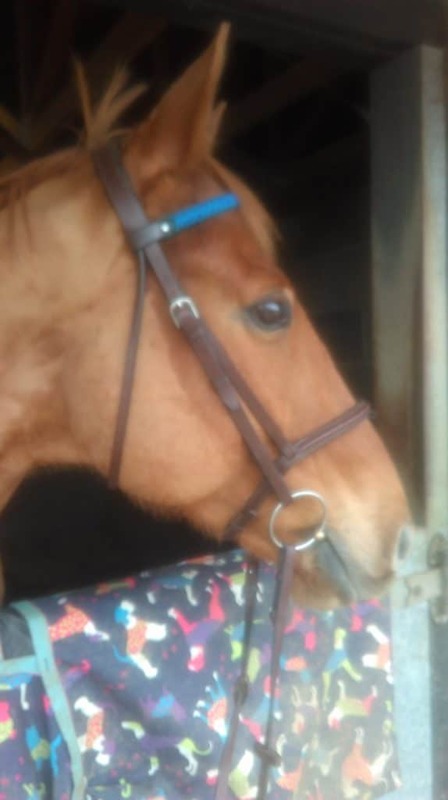 He is usually a Full size all round, but since the browband was going to be made especially for him, they recommended measuring our current browband to make sure we get the best fit. I currently had Scottie in 2 browbands (we have 2 bridles) one measured 16” and the other 15”. They were both different shapes and both fit well. So I asked for a 15 ½” which obviously was the right choice. Scottie is quite a hot horse and will often sweat where his tack sits, especially around his ears and where the browband attaches to the headpiece. Because of this I was a little bit worried about the cord material causing him to sweat more than his normal leather browband. But I was very wrong. We had a good session in the school when it was warm last week and Scottie had rather wet ears, but the browband was completely dry. This really surprised me. Along with me needlessly worrying about the new material browband causing more sweat, I was also worried about how hard it would be to clean. After all, I couldn’t just wipe it over with water and saddle soap like I do everything else. But I had a quick look at their website to see how they recommend looking after it and it sounds very easy, just give it a scrub with some water and washing up liquid! I haven’t tried this yet as mine is still really clean, but it’s nice to know it doesn’t need all this special care, because realistically, how many of us have time for that? more elegant/traditional colours and glittery thread which I think work great for dressage! There are so many design options that I do think there is something for everyone! You have the choice of 3 leather colours, 10 designs, 29 thread colours and diamante or chrome studs. They are also really reasonably priced with most designs starting at around £11. So really great value I think!